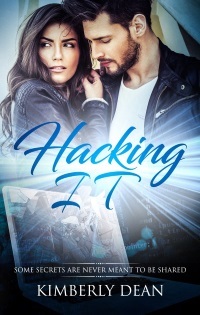 Hacking IT on Sale for only 99 cents! Like romantic suspense? Hacking IT has been dropped to 99 cents for a few days only. Get your copy now. It won’t stay this price for long. I need your help. Please hop on over to the All Author website and vote for Hacking IT for “Cover of the Month.” No sign-up or logging in required. Just push the Vote button! Thanks! The Hackers series is on a roll. 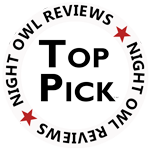 LOVE HACK has also been rated as a Top Pick by Night Owl Reviews! Hacking IT a Top Pick! I’m so excited. Hacking IT has been rated a Top Pick over at Night Owl Reviews. You can read the full review here or an excerpt from the book here. Book 2 in the The Hackers series is right around the corner! Coming March 8… LOVE HACk. His gaze snapped up and encountered wide green eyes. She’d finally noticed him standing there. The air between them snapped. “We’re closed,” she said sharply. As if that would make him go away. He frowned. He knew the building hours better than anyone. He set the door systems around this place, but telling a would-be intruder that you were alone was the last thing she should be doing. Unfortunately for her, he wasn’t an intruder. Her laptop was still open, and her fingers were poised on the keyboard. Well, that was a bit smarter of her. She could call for help faster than she could run. Her heels slowly lowered to the floor, and the fearful look on her face shifted to one of suspicion. She knew why he was here. Damn. He’d found himself wishing his team had been wrong. She’d better not be in Afire’s systems again. He bounced his heel against the wall behind him. He wanted to know what she’d been doing in their network in the first place. From the information he’d been given about her, she was a small fish playing in a very big pond. How had a web designer gotten past Afire’s security? What would somebody like her hope to find in Afire’s network? Their client list? Trade secrets? Who knew? But she’d gotten in. That was more than anybody else had been able to do. Her green eyes sparked, but she stayed quiet. His fingers tightened against his elbows. “Do you know anything about that?” he asked. He knew she’d done it. His top guy had shown him the proof. His inner antenna went on the alert. She pushed her hair back over her shoulder as she shook her head. She’d gone quiet again, but he could see it now. Disgust and simmering anger. Oh yeah. He could more than see it; he could feel it. What had Afire done to tick her off so badly? An Easter egg of some sort? Some stupid tic-tac-toe game? She held his gaze until he felt a fire light deep in his gut. Her voice sounded like bourbon on the rocks. Smooth, with just a tinge of huskiness. Yet underneath it all was a challenge. The room went quiet, except for the popping in the fireplace. Just when Luke thought she might be about to admit something, she batted her eyelashes at him. He straightened, his heart pounding too hard. Now he knew something bigger was afoot. Something his team hadn’t told him about or, worse, had missed.